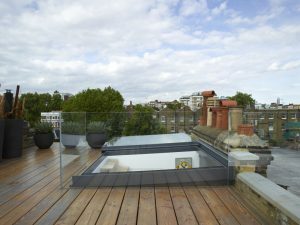 The ensuing creation of a delightful outdoor terrace in a five-storey Victorian townhouse in Chelsea was made possible by the installation of a sliding, retractable rooflight supplied by Glazing Vision. Stephen Fletcher Architects, renowned for their expertise in working with historically sensitive sites, have dramatically transformed this long and narrow townhouse into a stunningly impressive private residence complete with a new basement level beneath the footprint of the house, vaults and most of the rear garden. The internal rebuild was so extensive, with the relocation of an architecturally impressive staircase, that only the front façade and the roof of the original house remain. For Stephen Fletcher Architects the primary objective was to increase the sense of space throughout the restricted property. Glazing Vision’s Sliding Over Rooflight was specified as providing the best solution, given the limited roof space and was made to a bespoke size. Supported on tracks installed on the roof, the double-glazed rooflight abuts a fixed wall on one short side, and is framed on the adjacent side by an elegant glass weathered upstand, a nod to the glass balustrade of the staircase below. The external framework in slate grey nuances the polished grey plaster wall of the staircase, whilst the pure white, matt-finished internal framework ensures it enhances the airy ambience of the floor below. Its simple yet sophisticated sliding mechanism is electronically controlled at the touch of a button retracting the entire section of glazing, thereby providing an unimpeded, 100% clear-opening access from the stairwell out onto the roof terrace. In this case, Glazing Vision’s Sliding Over Rooflight maximises the amount of natural daylight within the property and ensures building occupants can make the most of the fabulous vistas over West London. However this multi-purpose product is also used in a variety of projects for ventilation purposes to expel heat and allow fresh air to enter the rooms below. To find out more about design considerations for your project, please call our technical department on 01379 353 741 or request a CPD.